The greatness of the Wreath Template is that it makes it so easy to create a beautiful & symmetrical image. With the template, you will place your 4×4 card in the square, stamp your image and rotate one corner to your left or right. The direction you rotate is up to you, but you will continue in that direction to create the finished product. In the photo above, I used my Stampin’ Write markers, but you can just as easily use regular ink pads. You will use the stampin’ write markers to color your stamps if you want a colorful image as in the example above. On your first wreath, you will place the first stamp on the card where you want it. Make sure it will not go over the edge, if you don’t want it to, continue around (close Stamparatus plate to secure the stamp). Place subsequent stamps on the card, continue around, (flip Stamparatus plates if necessary) to continue with 3rd & 4th stamps. Now that all stamps are on the plates where you want them, you can stamp all images then turn then continue around in one rotation to complete the rest of your cards. nce all cards are completed, you can now place them on your card base, centered or at top or bottom with snail or dimensionals. these cards are very versatile. you can use a full card front in the wreath template as well and do your design in an offset mode. 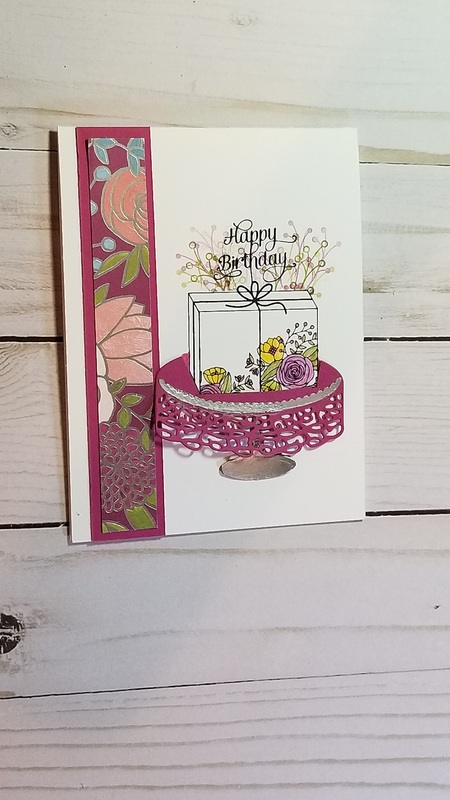 Just make sure to place the same corner of card front into the next turn of the template each to time to ensure placement is correct to create the wreath. It seems that the harder I try the further behind I get! Where have I been? It’s not that hard to write a note, show a picture of what I’ve been up to, and include the ingredients to the projects. So, here goes…I have been going crazy trying to accomplish too much in too short a time and not getting anything finished. That’s where I’ve been. I gutted my spare bathroom last June, it is still unfinished! I have the 2 end walls to cut tile for, then grout everything. After that it is install the toilet and vanity…. why is it taking so long? Well after we gutted, we traveled for 14 days, then weather and the holidays and life got in the way. So here I sit with not very much left to complete that project, but now it’s tax time. In between all this I have been trying to run a crafting business. This has been a difficult thing to accomplish this past 16 months. Why you ask, will a few of my clients have become ill and had to take a hiatus and a few are just taking a break and using up what they already have. I have had a few new clients too. 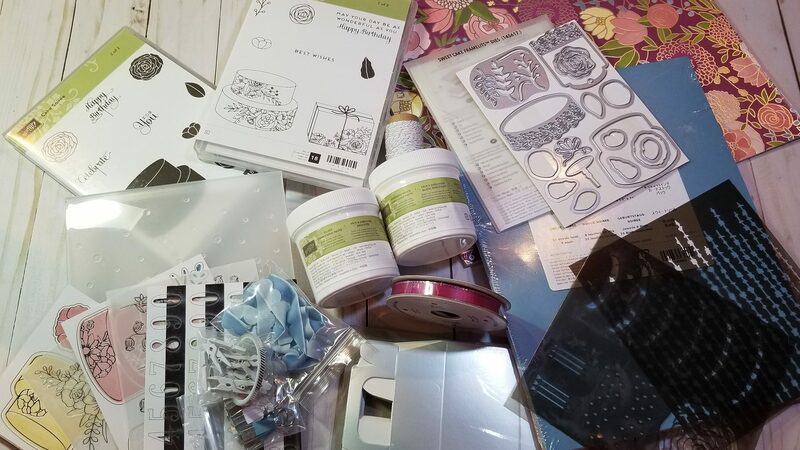 I am venturing into another realm of crafting with my cricut as well as paper crafting with my Stampin’ Up! supplies. My goal is to complete my taxes this week so I can complete the bathroom in April. We are traveling the first week if April, that is why I need to get the taxes done quickly. Hopefully I will get my act together and have some actual crafting on this blog the next time you hear from me… which will be more regularly. My goals for 2019: taxes complete, bathroom complete, blog once a week, craft classes twice a month and newsletter twice a month. See you soon with a fun project, in the mean time here are some simple cards that I was inspired by another demonstrator. Go get your craft on! 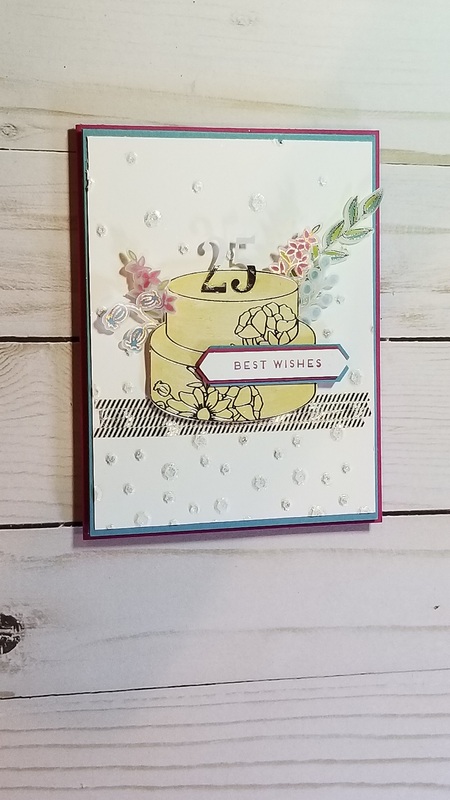 Perennial Birthday stamp set is so awesome! I am trying to focus on the beginner & casual stamper right now and this set is perfect for that. Check out this birthday card. I CASE’d (Copy and Share with Everyone) this from Pinterest and bumped it for the casual stamper as well. I stepped it up for the casual stamper by adding some rhinestones to the centers of the flowers. You could even add a little Wink of Stella to glitz up the flowers. I stamped my sentiment where I wanted it on the front of the card, then used the Post-It paper to cover it (so it had a straight line top & bottom). I took three different stamps from the Perennial Birthday Stamp set and stamped diagonally across the card front. I used one stamp at a time – colored with the markers, huffed (blow warm air) and stamped. I filled in some of the white space with the smaller flowers. You still need to leave a little white space for pleasing the eye. Go ahead, CASE this yourself and make a dozen or so, so you are ready for that next birthday! 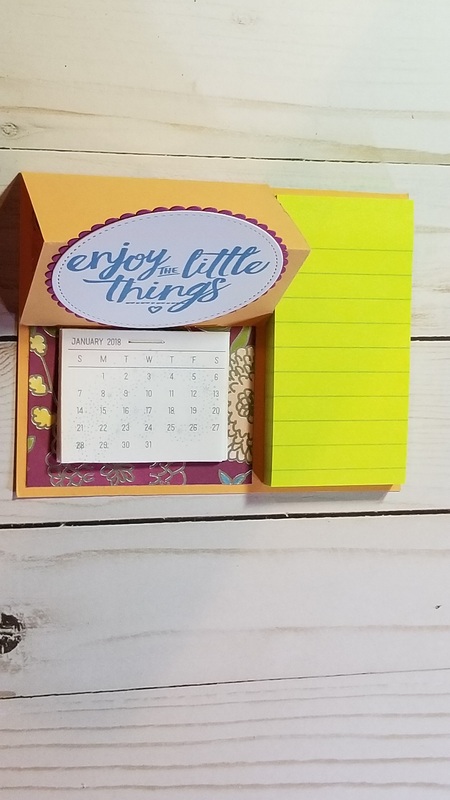 October starts a new year for all Stampin’ Up! independent demonstrators. We set new goals and monitor our reports diligently to make sure we are hitting those goals and our team members are hitting their goals as well. Happy New Year y’all! increase my team membership by 4. So, what do I do to make these goals happen? For one thing, I am taking a break from my part-time catering job so I can focus on my business. I am adding classes/workshops/stamp camps to my calendar. I will hand out my business card to pretty much everyone I meet and answer any questions that may produce in the hopes that I will gain a new client. I am definitely going craft every day so I have lots of samples for everyone to see and entice them to purchase what it takes to make some of these crafts on their own. I plan to learn how to film & edit videos to increase my social media presence as well. I also plan to be more present on this blog! So there you have it, This is my plan from October 2018 through October 2019. I hope that y’all will keep following me and invite your friends to follow me as well. Remember crafting is fun, and it’s more fun with friends! Posted on October 5, 2018 Categories UncategorizedLeave a comment on Happy New Year y’all! OMG…Life needs to get under control! Here I go again! Feels like it has been forever since I have written a blog post. I just can’t seem to get a handle on this thing called life! I need to get under control! If it’s not the family pet, the hubby has an issue, the grandkids need something, or it’s a home project…So many things just keep me from doing what I love to do, but that is going to stop!!! So here is what is going on right now: Hubby is on a new medication and that requires weekly doctor visits for lab tests to monitor progress. The dog is currently going through some kind of infection and has multiple medications and vet visits just about every other day. The grandkids, oh I love them so much! They recently moved closer and that is so awesome, however, now I am the on-call Nana if one of them isn’t feeling well and needs to be picked up from school. Don’t get me wrong, I will drop what I am doing for them if they need me. Then there is the house…the house always requires something. We just finished the fence from he!! project. It took three weeks instead of three days, because the contractor became ill and was hospitalized for a week, and it rained like there was no tomorrow! The last project is my mother’s bathroom remodel. Granted this project was my idea and mostly my baby. But I am about over it! I keep getting interrupted in the process. I am currently tiling the shower curb, then the walls, followed by grouting. After all that is done, we install the new toilet & vanity. So ready to finish it. Forward from this is Halloween, then Stampin’ Up! OnStage (convention), the winter holidays begin! So I am going to make a promise here and now; January 1 is my new beginning. I will be present, I will post regularly on FaceBook, I will blog weekly, I will send out bi-weekly emails to all my clients, I will be videotaping cute projects on a weekly basis and posting to my Youtube channel, I will plan at least 2 events a month (if not more, that all depends on you, my friends). Know this, even though I have so much going on right now, I am still here for you. Just email or text me, private message me on Facebook, call me. I will make the time to get what you need because that is who I am. 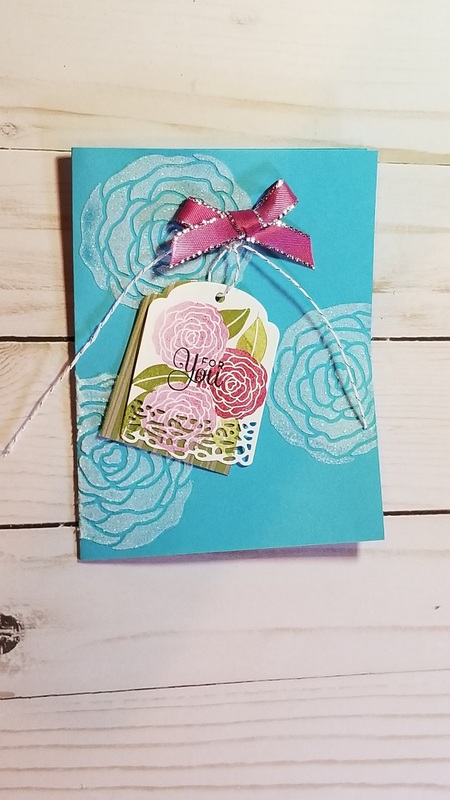 I love crafting with my Stampin’ Up! products. We have so many cute things in the Fall/Winter catalog that just launched 2 weeks ago. If you don’t have a catalog, contact me and I will mail out the annual & fall/winter ones to you immediately. If you have a question about any of the products or techniques, I will do my very best to answer your questions. What I don’t know, I will find out. Posted on September 15, 2018 Categories UncategorizedLeave a comment on OMG…Life needs to get under control! Where have you been? Around…I promise to get more consistent with posting here. I am a retired person and shouldn’t be as busy I am. Not sure where all my time goes, but it does. Have you been losing time? I do all the time! Where have you been? I have been living life. There is grocery shopping, doctor appointments, house cleaning, repairs & maintenance things to do, TV shows to catch up on, some part-time catering to do, and a little last minute traveling to drag your best neighbor (because I love & miss her) back to Texas from the icy cold of upstate NY! All this stuff gets in the way of my crafting time in one way or another. I swear (over the last 2 1/2 years) I am busier now than when I worked full-time. What am I going to do about it? I am going to start pairing down all these activities. I am going to put things on a schedule and try my darnedest to follow said schedule. I am exhausted and don’t realize it till I find 5 minutes to stop and realize it. Then I lose more time because I do have to catch up on sleep! So, scheduling is going to be my best friend from now on. Where have you been? This is my new mantra. The answer from now on is on my calendar in a time slot designated for a specific activity. I am using a digital format right now (and I sometimes double book myself), but I am going to start using that $40 planner I bought (some time ago) so I have a physical view instead of a little chime coming from my phone reminding me of something I completely forgot I booked myself into. All the big-time organizers say to keep one calendar to make your life simple. Too many places make for a lot of double booking and a lot of upkeep & maintenance. However, everything will still go into the digital calendar as well because I don’t want to lug a planner around with me. I want to paper-train myself first to make it a habit and make my brain aware that I must check the calendar before I say yes. So if you are always asking yourself “Where have you been” and keep losing time, get a paper calendar and write it all out so you can see it plainly. It’s not going to hurt to also put it in your phone calendar as long as you write it all out first. I want more quality time with my family & friends and this is the way to achieve that for me. Happy Calendaring people. Come back to see what I am up to next…I promise it will be interesting and most probably creative! Time to Bundle up with Sweet Soiree! 2017 has come & gone. Time to Bundle up! It’s been a busy 2018 already! Sale-A-Bration (SAB) has begun, our biggest event of the year, and it coincides with the launch of the Spring Occasions catalog. There is so much beautiful product to see, how do you choose which to make your own? Well, let me share what I chose to start out the year with. Believe me, it was difficult to decide what to get first. My shopping list is long, and the budget is in the works to make it all happen. I am blown away by the Sweet Soiree suite! I took the time to bundle up! 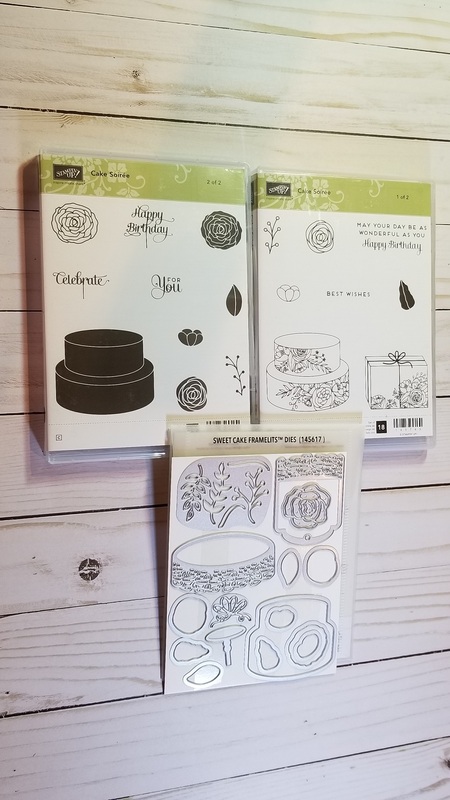 The Cake Soiree stamp set & thinlit bundle is amazing. This may look like all you can do is stamp cakes, but it is so versatile, you won’t believe it till you see it. Let’s move on to the Designer Series paper…OMG! The beautiful silver foil on one side makes for an elegance you can’t imagine. The colorful print on the other side adds to the whimsey. The Ribbon is to-die-for! I ordered 3 spools of it. There is a fun embellishment kit in this suite that has fun stickers, cute tiny tassels and clothespins, washi tape, and velvet ribbon. Want some texture? We have it…Silver embossing paste & Shimmery White embossing paste work beautifully with the decorative masks. Add some more texture with Scattered Sequins Dynamic embossing folder. 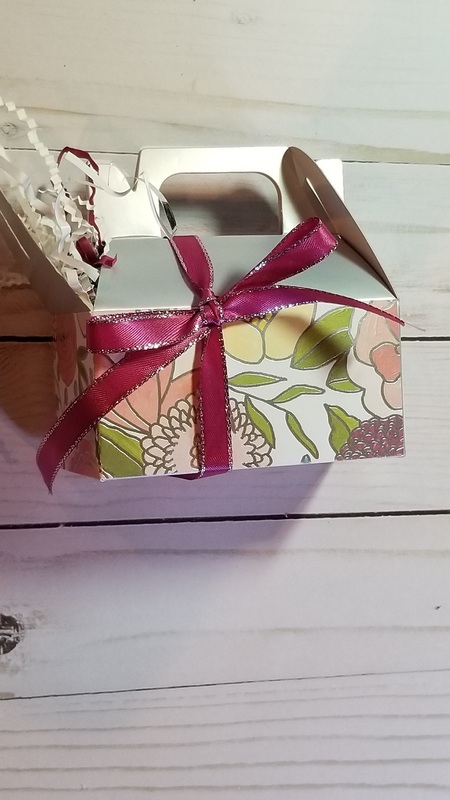 Top it all off with beautiful packaging for that special someone…a bit of colorful shreddie in the silver gate boxes make an amazing presentation, you can tie on the hand-made gift tag with silver bakers twine. Oh, and don’t forget the coordinating cardstock pack (Berry Burst, Marina Mist, Old Olive). So much awesomeness packed into one product suite! If you were to get this entire suite (you will want it all), you will also earn your choice of 3 first tier SAB items or 1 first tier and 1-second tier plus Hostess Rewards ($15) to use for anything else you want! Notice I didn’t say NEED…I mean, we need some things, but we WANT it all! There is definitely a learning curve with embossing paste. I would recommend using it on a layer vs the card base. The silver embossing paste is a thinner consistency, so it will take a little longer to dry and I would use some temporary glue on the mask because it has a tendency to bleed under. You can use our multipurpose glue – -when it dries, it is still tacky, which make it repositional. just don’t leave it too long so you don’t damage your design. 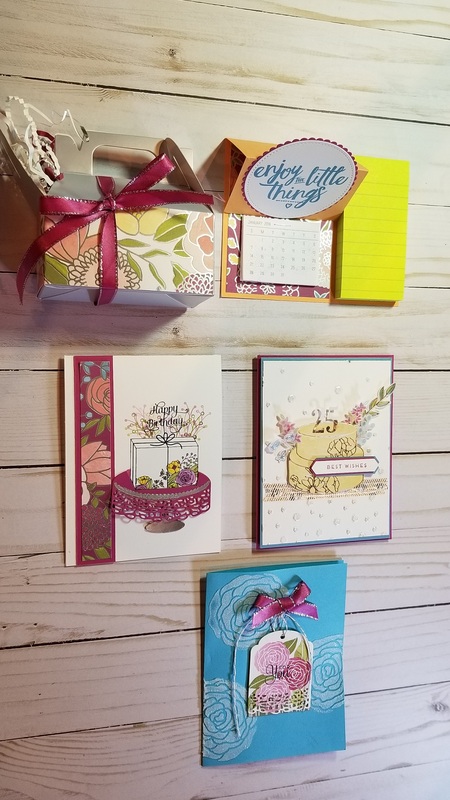 Check out all my examples, I have 3 cards, gift package, and a desktop calendar. Click the Tutorial link for dimensions & instructions. Click the little froggy to see what other wonderful ideas are out there! Posted on January 14, 2018 January 15, 2018 Categories Blog Hops, Tips & Tutorials, UncategorizedTags Bundles, Sweet Soire13 Comments on Time to Bundle up with Sweet Soiree! Make your list and check it twice! We’re entering the “most wonderful time of the year,” and not just because of the holidays. For us, it’s because Online Extravaganza is starting soon! During this promotion, we will have exclusive deals and sales available for limited times. With different offerings coming throughout this promotion, you’ll want to keep in touch and check back for all the great surprises we have in store. Our first incredible offering of this promotion will be the 24-hour stamp sale. Select stamp sets will be 20% off for the first 24 hours of Online Extravaganza. Stamp Sale starts November 20 12:00 AM and ends November 20 11:59 PM MT. Check out the list and Click HERE to get yours now! 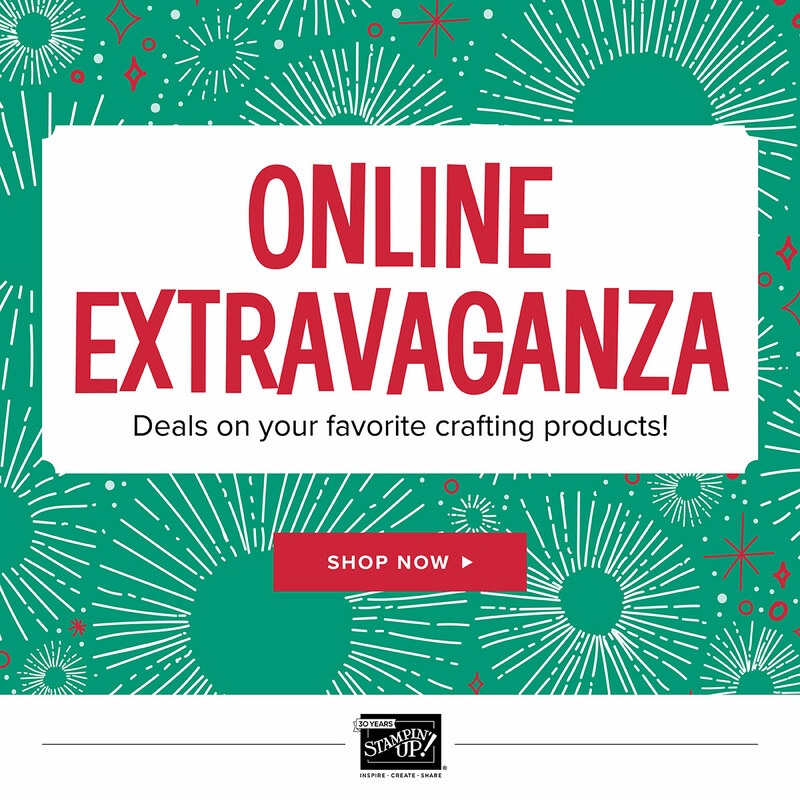 Posted on November 19, 2017 November 20, 2017 Categories Products, UncategorizedTags holiday special, SalesLeave a comment on Online Extravaganza starts tomorrow! 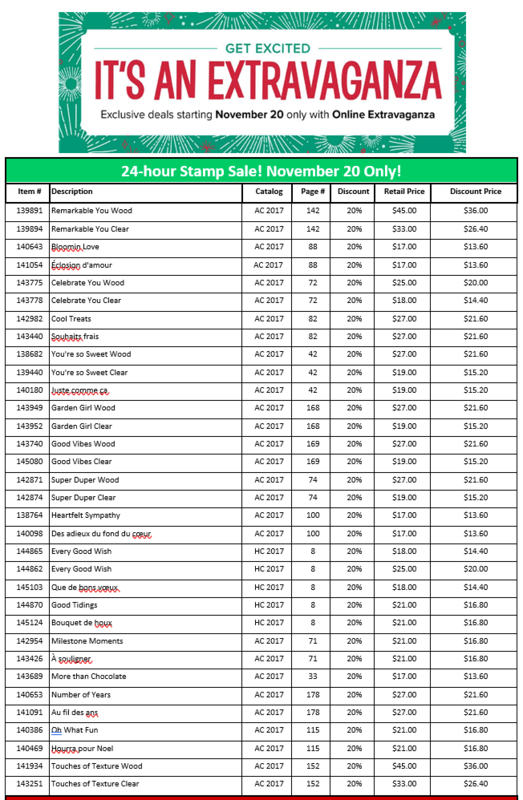 The Stampin’ Blends were made available on November 1st. You gotta get some of these…they are fabulous! I purchased the original Blendabilities a few years ago and I love them then. I was so excited to see that Stampin’ Up! was bringing that back into our product line. These alcohol blending pens have been years in the making…lots of testing to make sure there were no issues with the end product. Stampin’ Up! prides itself on a quality product. If you like to color and aren’t too sure about shading & lighting, these pens are awesome. You get two shades in a pack and there is a color lifter/blender pen to help with shading. There are lots of youtube instructions out there to show you different techniques. You can mix media and use your watercolor pencils, and you can mix colors without messing up either pen tip. 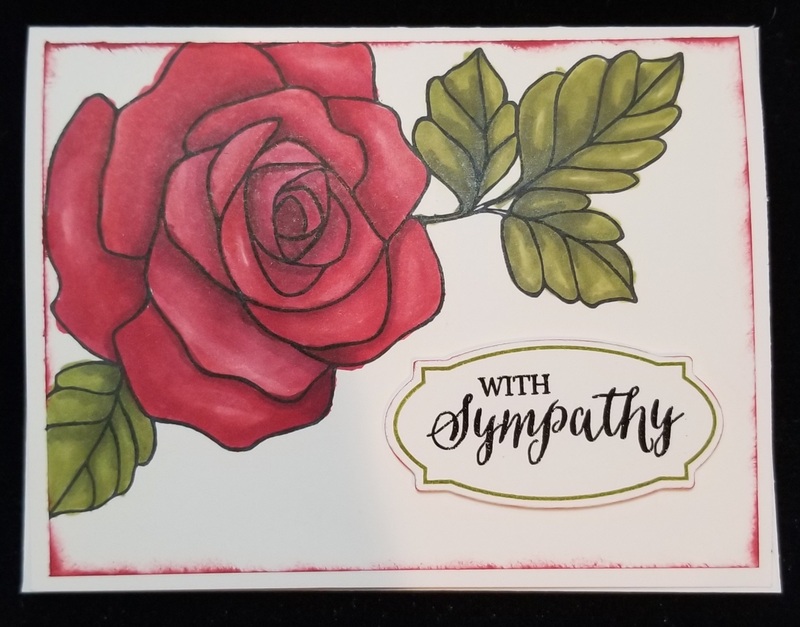 Using my Stampin’ Blends, I created a few sympathy cards. They turned out pretty wonderful, didn’t they? 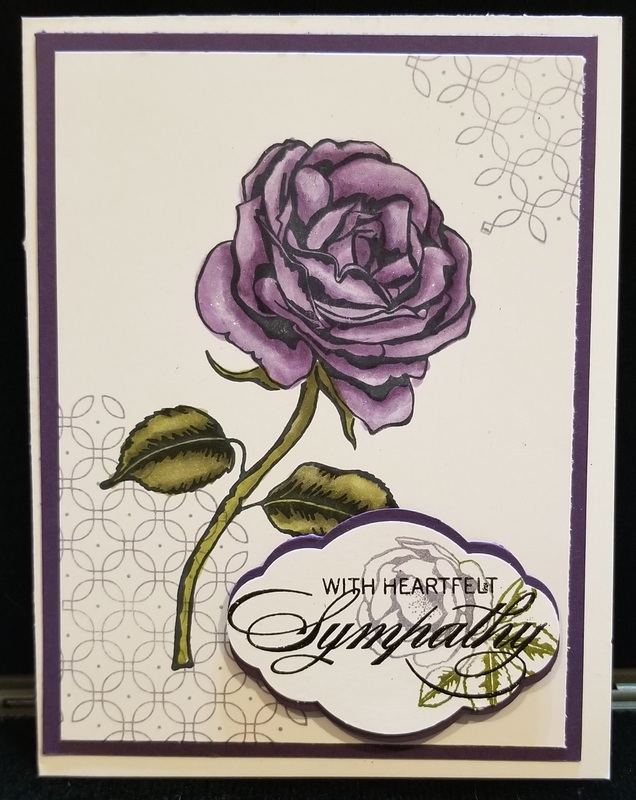 I used the ‘retired Wisteria Wonder Blendabilities’ because I wanted this color to go with Elegant Eggplant card stock. 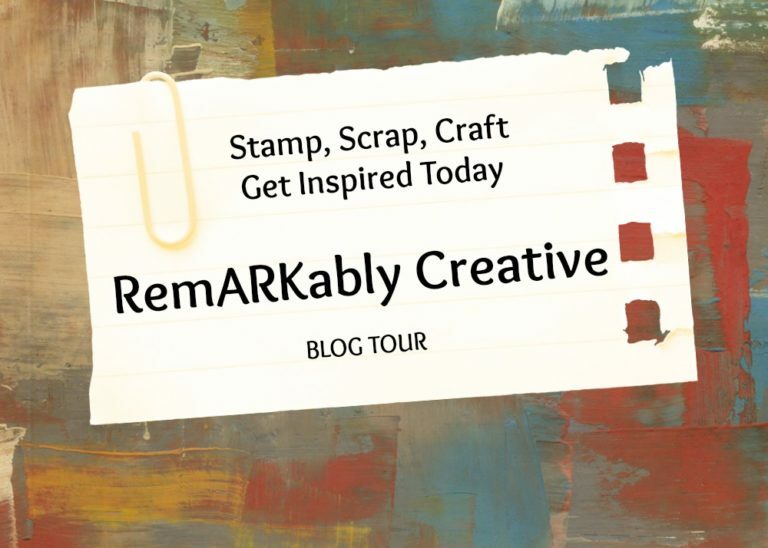 I am hoping it will be a future release for the Stampin’ Blends. See the list of all the product used below. You are currently viewing my, Francine Wilson, post. To continue on to find more great ideas & tutorials click on the next name in the list. Thank you for stopping in, come back anytime! Posted on November 19, 2017 October 29, 2017 Categories Blog Hops, Markers & Inks, UncategorizedTags Coloring, Stampin' Blends11 Comments on Stamp, Scrap, Craft, Blend! We are coming into the Thankful or Give Thanks season. Why we don’t exemplify this thought throughout the year has puzzled me. Personally, I am thankful all year that I live & breathe and have my family & friends with me. I try to reflect that as I go throughout the year by telling my family & friends how much I appreciate them with my words and my actions. I try to send out cards, although not always on time! 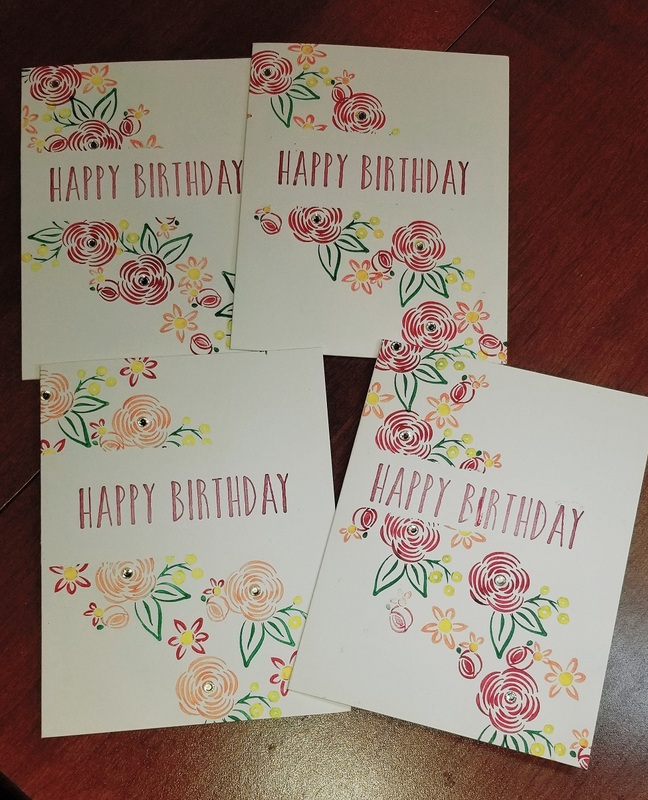 For some reason, a special occasion comes along and I don’t have just the right card even though I make tons of cards. Getting creative real fast is pretty easy with Pinterest for inspiration. You may just be starting the blog hop here at my blog – Francine Wilson or may have come from the person previous to me on the list. If you get off track at any time, the full lineup below will help you move along from blog to blog so you see all the projects. 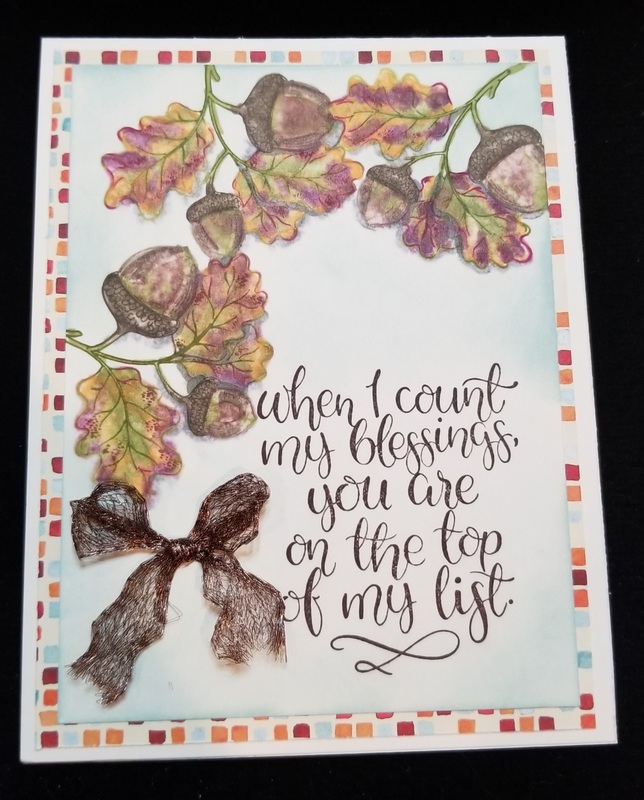 For this post, I am presenting my fall So Thankful for You card. I used my retired smokey slate blendability to add shadow since I don’t have a full set of the stampin’ blends yet. Still working on my blending skills, but I think this turned out well. The color lifter works wonderfully to give a lighter effect and mute the colors. Thanks for taking part in our blog hop, there are so many amazing ideas and inspiration you don’t want to miss. Remember that currently, you are at my blog – Francine Wilson, so check the blog hop line up list to see who is next in the list.